Watch a two-part video series about the making of "Ekko." At Freswick Castle on the northeast coast of Scotland, past meets present, land meets water, and the sound of the wind meets the sound of the waves. When Seattle Pacific University Professor of Art Roger Feldman was commissioned to design and build an art installation on the castle grounds, he wanted his piece to bring all of those things together. The spiral shape of “Ekko” creates a quiet, protected space for people to sit and listen to the wind and waves outside. 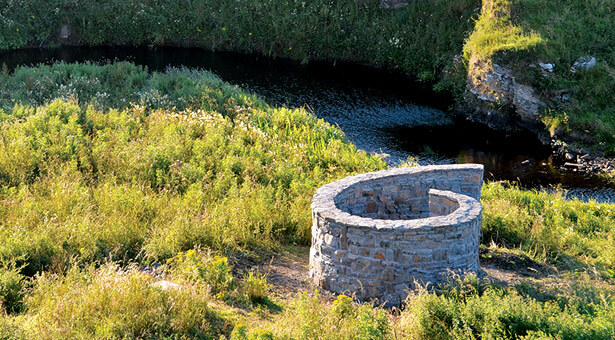 He crafted “Ekko” over summers 2011 and 2012, using stones hewn by the 12th-century Vikings who built the original castle, and fitting the stones together with mortar “like a giant jigsaw puzzle.” The name “Ekko” is “echo” in Norwegian, the Vikings' language. Now complete, “Ekko” is designed to stand for hundreds of years. What will future visitors think? “I would hope that people would discover it on their own and be curious, and, without being told what to do, would actually walk around it,” Feldman says. Watch this two-part documentary series about the making of “Ekko” — Ekko and Ekko: Return.